Security is very important these days, especially, with the growing online industry. Due to this, there are certain vulnerabilities that your server and browser have to face. To combat this, SSL certificates are typically installed to add enhanced security to all your pages where the end-users are expected to submit their highly confidential data. When a web page uses an SSL certificate to secure a connection, the URL gets changed from HTTP to HTTPS and here the ‘S’ standing for ‘secure’. The users will also see a padlock and, that is in the case of extended validation certificates, and Comodo SSL certificates where the entire address bar will turn green. SSL certificates are issued to the websites by a trusted third party that is called as a ‘Certificate Authority’ (CA) and is available in a variety of types and validation levels. It is the quickest and the most reasonable way for an online business to protect users and customer online transactions. You may get a great value-added package which you can buy depending on your small to medium size businesses. If you chose Comodo SSL that means your site will enjoy the highest security levels and you’ll also get additional tools that will win your customer’s trust and increase the sales conversions. Every website has different needs. Thus, in this quickly growing online marketplace, it is essential to separate SSL Certificates in the form of their feature, price, and usability. All the Comodo SSL Certificates offer 256-bit encryption with the latest SHA2 hash algorithm, but they are often different in terms of requirements. Every Comodo certificate comes with visual indicators that inform the users that the site uses SSL encryption. The process to install SSL certificate is not tough but needs to specify steps to follow. It happens with the latest cPanel 11.38 releases that come with this new SSL/TLS Manager which is available for cPanel users when enabled in WHM. 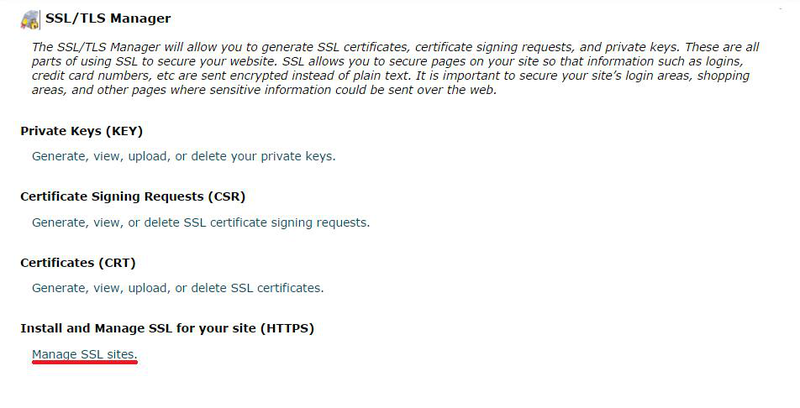 This SSL/TLS Manager gives you the ability to generate, view, or upload, private keys, Certificate Signing Requests (CSR), and certificates (CTR) and also allows capacity to activate an SSL certificate on your website. Step #1: Is a Dedicated IP Address needed? Not really, because in many cases if you have Server Name Indication protocol (SNI), then it is no longer necessary for a site to have a dedicated IP address to utilize an SSL certificate. Step #1: The first step is the authentication of the SSL certificate via Certificate Authority (CA), then only rest of the processes will get started. 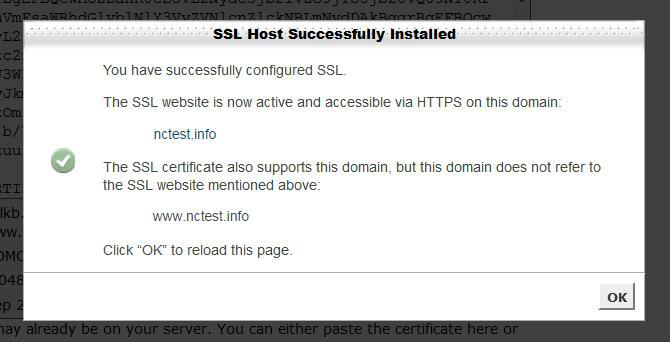 Step #2: Now the Installation Procedure of Comodo SSL Certificate using WHM/cPanel starts. Please see: Only the administrator will be able to install the certificate, but if you are not an administrator then you have to get in touch with your admin. 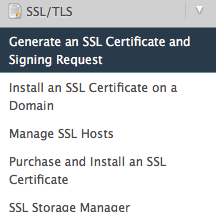 Step #6: Now, click on the “Do it” button – The SSL Certificate is added to your server and assigned to the domain. Hurray! Here you will have to click on the Autofill by Certificate button, which appears next to the certificate entered, and then a system will attempt to fetch the domain name and the private key. You can also choose the domain from the drop-down list menu and manually enter the certificate and private key into the corresponding boxes. If the system fails to get the private key, you can locate it later in your Private Keys (KEY) section in SSL/TLS Manager. Make sure to include Begin/End headers and footers for the certificate and the key. 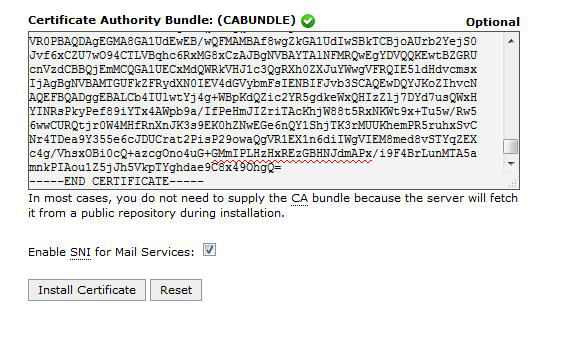 Step #7: Now, copy and paste the chain of intermediate certificates (CA Bundle) into the box under Certificate Authority Bundle (CA BUNDLE). You can also use this certificate for Mail Services; tick the checkbox ‘Enable SNI for Mail Services’. Here you can choose your own domain where your SSL certificate has been installed. But please note that this option is only available starting from cPanel 11.48. If you are using an older version of cPanel, you cannot use your certificate for mail. To conclude, we hope all the above steps are quite clear and informative in explaining the importance and installation process of Comodo SSL certificate. Write to us for more information.